Comfort items and extra items, again all made from the original WWI/Great War patterns. Here we have body belts, washcloth, hot water bottle cover, knee caps, pillow covers, eye bandages, ear muffs, and knitted and crocheted ties. Feel free to contact me with any questions or to custom order your items in your choice of many wool or cotton colors. Hot water bottle cover and eye bandages are $20. Wash cloth is $8. Ear muffs and ties are $25. Knee cap covers are $35. Body belts are $50. Pillow covers are $25-$40, depending on size. This is an abdominal scarf belt. It is wrapped around the torso. Here is a circular body belt. It is like a tube. It has ribbing at the top and bottom to fit securely. 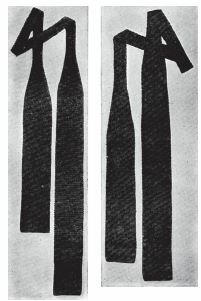 A ribbed body belt. 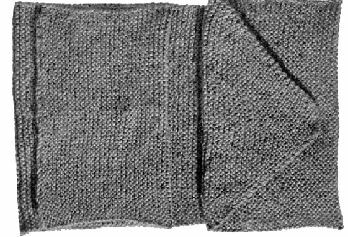 It is knitted in ribbing the whole way around and is also shaped like a tube. This shaped body belt has shaping rather than just a tube shape. Here is a knitted pillow cover. Knee caps protect the knees and keep them warm. 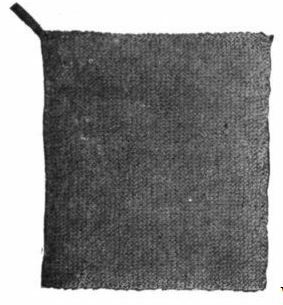 Washcloth. This is knitted in cotton rather than wool. The washcloth I knitted. (This one was from a Scottish pattern, so that's why it is shaped a little differently. The hot water bottle cover I knitted. 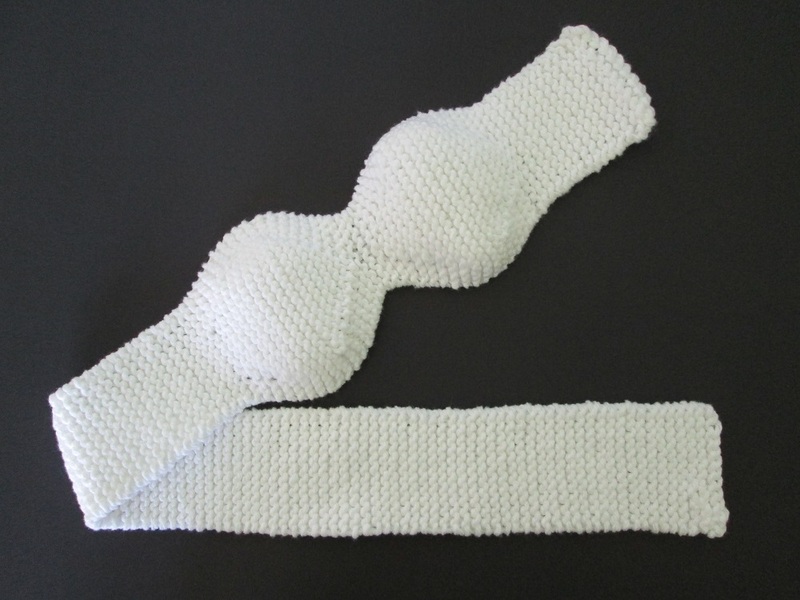 The pattern specifies white cotton yarn and cotton tape for the tie at the top. This is Eye Bandage No. 1 (original pattern photo). Here is Eye Bandage No. 2 (original pattern photo). This is Eye Bandage No. 1 that I made. 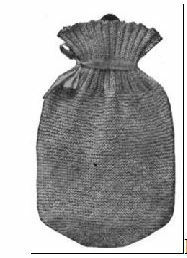 It is knitted from cotton yarn as specified in the original pattern. Eye Bandage No. 2 that I knitted; again made from cotton yarn, but with the addition of cotton tape strips. 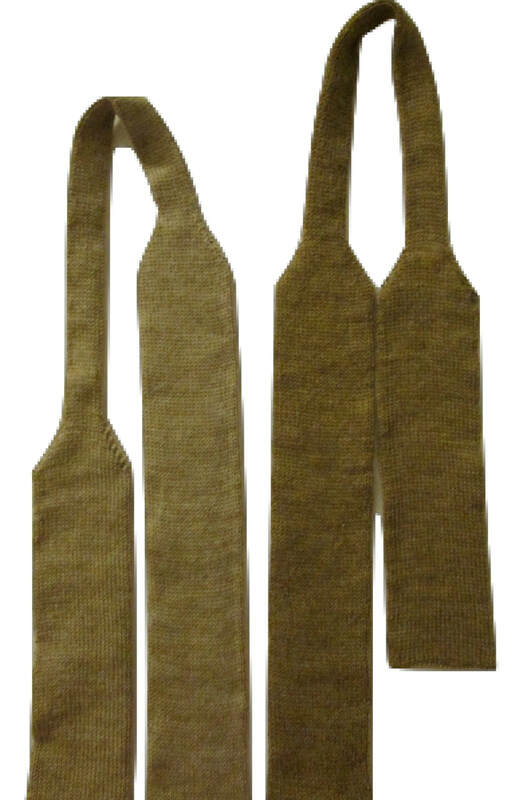 These are two of the knitted ties I made. 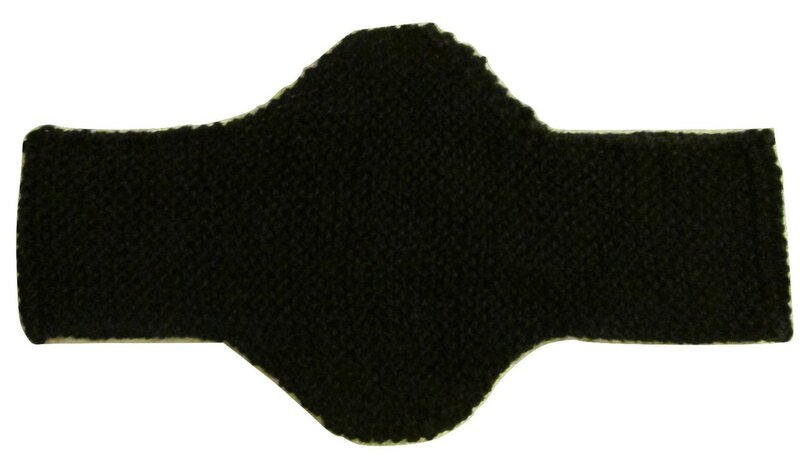 This is a pair of ear muffs that I knitted using black wool yarn. 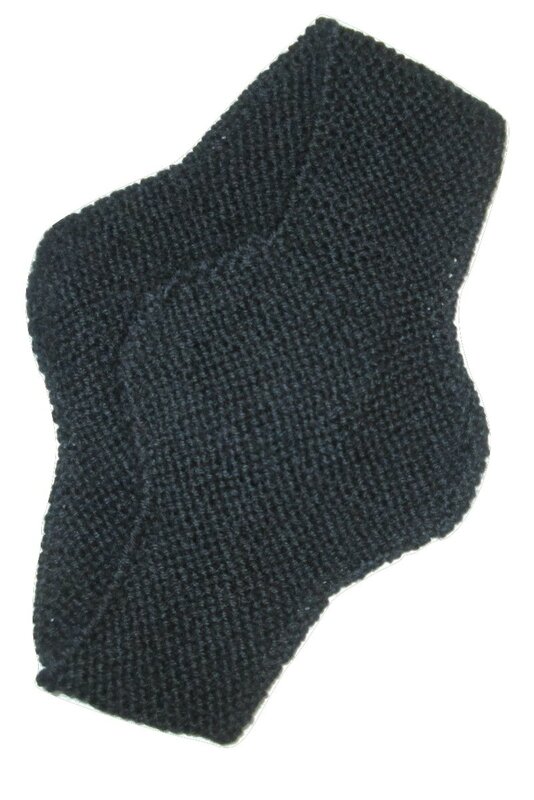 This is another photo of the black wool ear muffs I knitted, but photo taken without camera flash.